Architects in Lahore are trying to come up with new methodologies through which they could add up to the developing metropolitan vision of the city. 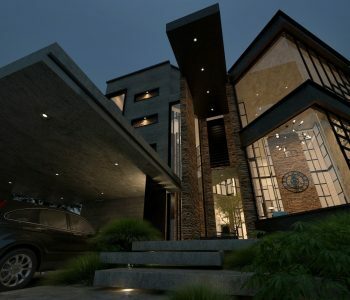 We, as a responsible Architecture Firm, aim to introduce a contemporary finesse to the existing aesthetics of Lahore. Residential sector is an extensive part of the urban layout of a city. It’s imperative that we give attention to the exterior design of the house as much as we focus on the interior living spaces. The facade of a building may leave a lasting impact on the urban environment of a city for years to come. This project is based on the essential pinciples of post-modernism. Elements such as geometrical rotations, assymetrical formations and fragmentation of building functions line out the basis for post-modern architecture. 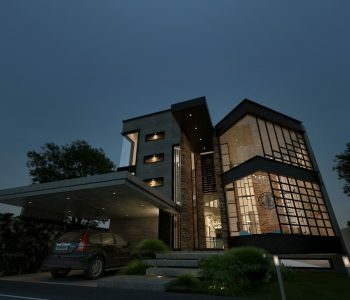 This building explores the complexity of design in the elevation, as well as the spatial layout of the house. A facade such as this tends to grab the attention of a passer-by. The use of earthly colour tones along with traces of black adds elegance to the design. The use of materials is diverse. Concrete, brick, wood and steel sections are composed in a harmonious manner in order to provide the building with a well-balanced facade. 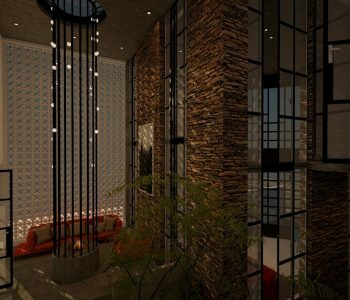 Steel sections add a certain unapologetic originality to the design, while the bare concrete walls and ceilings give a brutal raw finish to the exterior and interiors of the building. 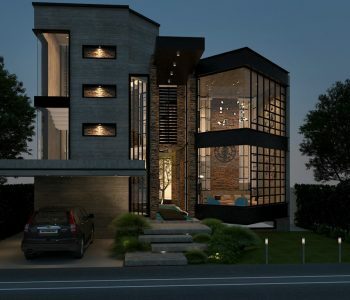 The front facade comprises of a giant double height window which opens from the living room out into the front lawn. The entrance of the house is a double height opening on to a wooden deck that hovers over a narrow water body and leads up to a centralized tree around which the entire building wraps. 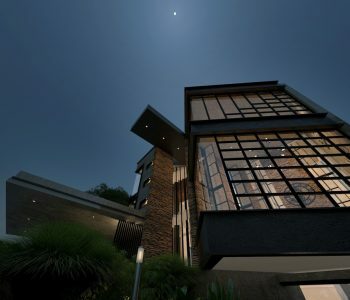 Double height windows and natural elements such as water and tree give a spacious and calm feel to the house. 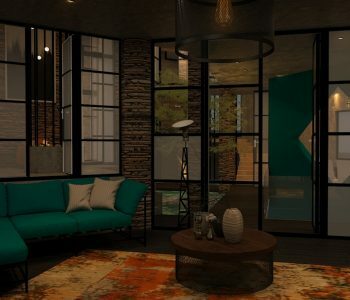 Since Interior Designers in Lahore are now following a minimalistic approach which is the outcome of certain contemporary movements in the realm of design. We try to go with the flow of trends, as well as add our own signature elements to the design, according to our client’s wishes. 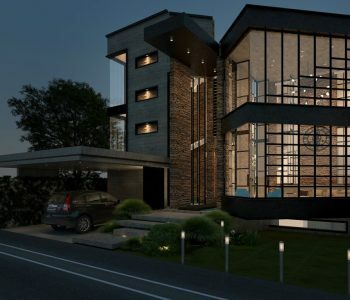 This project is a humble attempt to amalgamate the modernist dream of a Lahori with the regional standards of a traditional residential design.